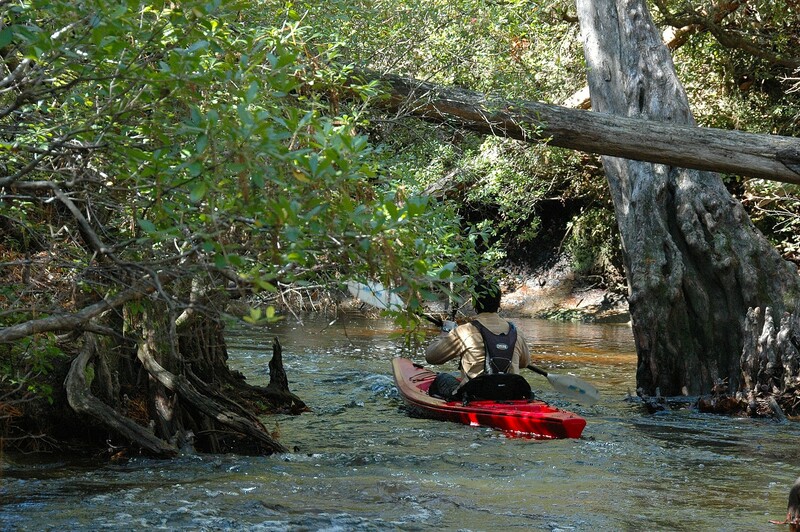 The paddling guidebook states that because of the enormous number of tree pull-overs, portages, and treacherous conditions at lower water levels, the Econfina River MUST NOT be paddled when the water gauge level at the put-in point is below 2 feet. We peer over the bridge to read the gauge. Besides, we tell ourselves, we've surely faced much worse in our many past paddling ordeals. No, we've come too far (a five-hour drive from home) to turn back. The day is absolutely perfect -- weather-wise. The temperature is a crisp 70 degrees. The air is sunny and dry. The rain from the night before has added water to a river parched by a long drought. Early on, we find ourselves spilling over small waterfalls. Before we are able to catch our breath, we quickly approach sharp turns that propels us down an absolutely exhilarating, shocking DOWNSLOPE. So steep does this downslope appear that I feel myself leaning back in my kayak, disconcertingly wondering whether I have the ability to negotiate the high speeds that lie ahead. In combination with the water velocity, and the half-pipe-like, narrow limestone tunnels we plummet down for several hundred feet, the ride is rather alarming for a flat-water kayaker such as myself. "Am I still in Florida???" I feel as if I am hurtling down a bobsled chute in the Winter Olympics. Each time we approach the beginning of one of these runs, I giddily turn back to my kayaking buddy and exclaim, "HERE WE GO AGAIN!!!!!!!!!!" For miles, we ride this immensely enjoyable kayaking rollercoaster. It is the most fun I've ever had paddling a river. 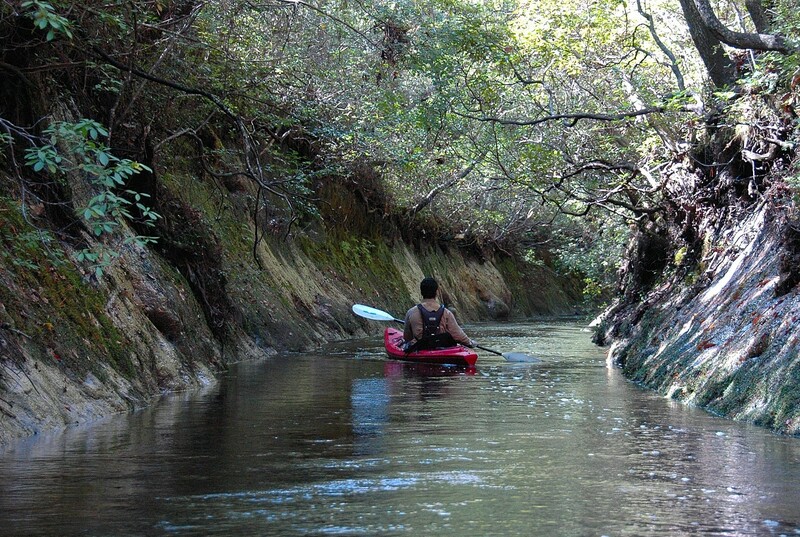 The high-velocity current, and the sharp turns in the limestone and fallen trees makes this, under normal water conditions, a highly technical paddle that only the most skilled paddlers should consider sampling. This river is not for a novice. 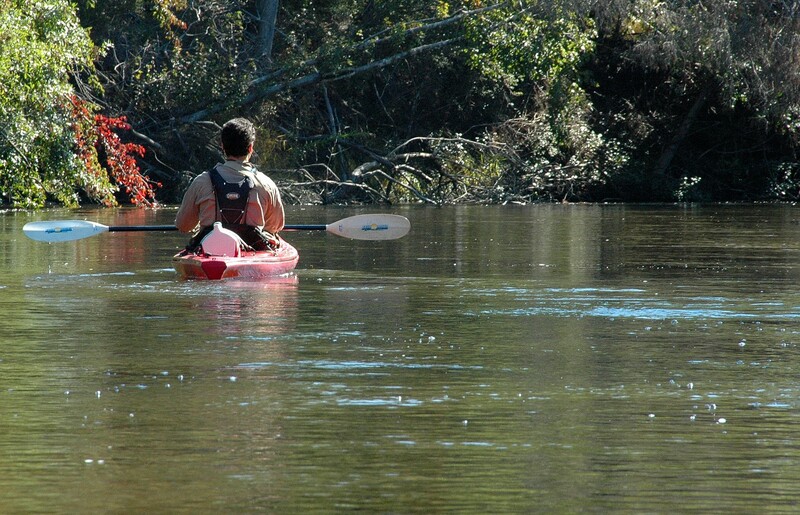 All of our kayaking abilities are tested -- particularly paddling cross-current and keeping a straight line. 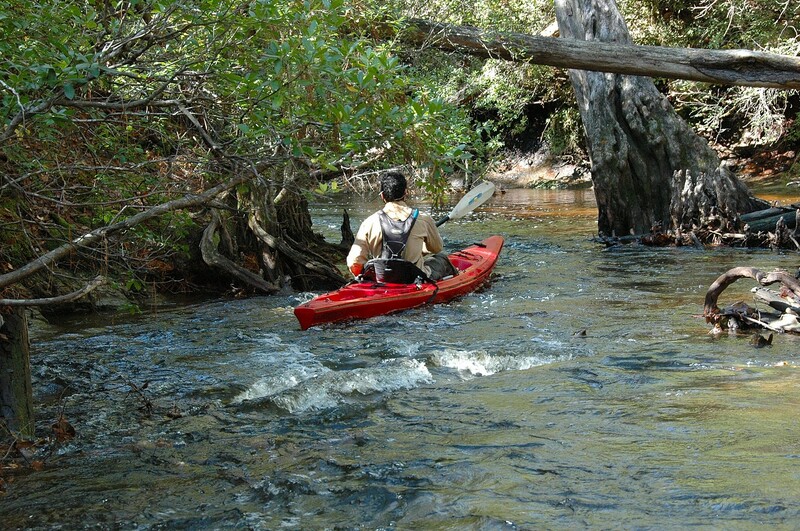 Pulling alongside a fallen tree (to pull the boat over it) is particularly dangerous, as the strong current will quickly overturn the unsuspecting kayaker. Indeed, on this day my boat flips twice (which ordinarily never happens to me). On the first flipping, my highly coveted Nikon camera and wide-angle lens are unceremoniously dumped into the water, surely ruining both the lens and the camera body. At one point approximately five miles into our adventure, we come upon an "S"-shaped limestone wall formation that feels to us like gliding through a curving slot canyon. On the day before, we drive to Pensacola. It is my first visit to the city. We have dinner at the delightful, loud, boisterous Dharma Blue restaurant. Dharma Blue is found within the Pensacola Historic District, where one finds magnificent historic homes. After dinner, I ask our waitress where we can find microbeer brewed on premises. She suggests McGuire's. A real institution. Quite a find. We enjoy a glass of fresh, yummy Irish Stout. Another impressive display here in this happy, bustling Third Place are the many photos of illustrious people who have visited. Bob Hope. George Carlin. Tip O'Neil. Jimmy Page and Robert Plant. John McCain. Jack Kemp. Strom Thurman. Willie Mays. While the historic district and McGuire's are both impressive, I find the city, overall, to be poisoned by an enormous number of highway overpasses, angry and multi-lane raceway roads, huge asphalt parking fields, and no "there there." Homes and offices and shops are so spread out from each other -- even in the historic area -- that travel is measured by a long car ride rather than a short walk. Driveable suburbanism rather than walkable urbanity. "Main Street" in Pensacola shows a heroic, admirable effort to create walkability with streetscaping (on-street parking pockets, human-scaled street lighting, landscaped bulb-outs.) But it is not enough. A roaring four-lane road cannot be a walkable main street, no matter how much window-dressing is applied. One of the most amazing aspects of the Perdido is that, like the Econ, there is absolutely no development at the water's edge. On the Alabama side, moveover, there is not even a small little dirt jeep trail within miles of the river, at least according to our Delorme's maps. The river appears to be flanked by giant expanses of undeveloped hunting grounds. Perhaps the most visually impressive aspect of the beautiful Perdido are the numerous sand bars one finds along the way - many of which are perfect spots for camping. The sugar white sand bars are brilliant white in color. In the sunlight, they appear to be glowing. Almost blinding to look at due to their brilliance in the sun. 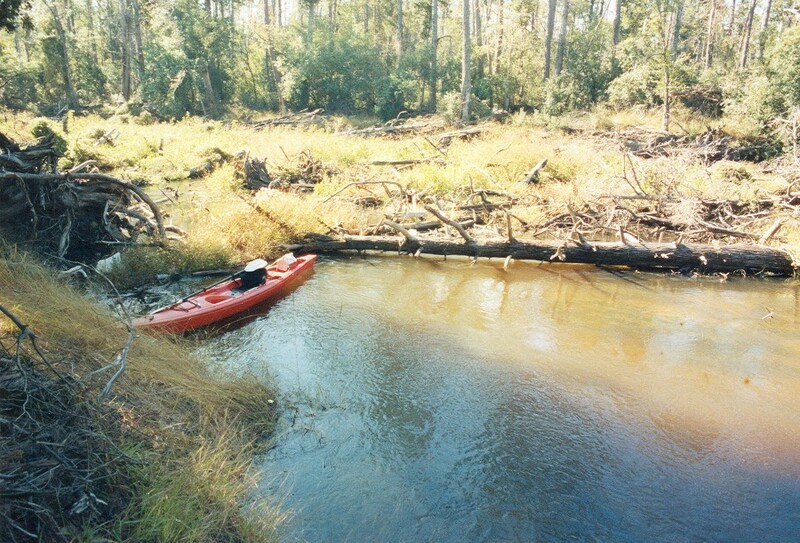 The most important difficulty on the Perdido section we paddle is the 3 or 4 logjams we come upon. Unlike others we've experienced in the past, these jams are hundreds of feet in length, requiring a long portage through very thick, nearly impenetrable underbrush and fallen trees up on the solid ground of the flanking forest. The jams are overgrown with thick living vegetation, which suggests the jams have been in place for a great many years (see photo below). The shallow, log-jammed Perdido (and the tree fall pull-overs on the Econ) help explain the complete lack of motorboat activity on these rivers (a delightful state of affairs for a paddler). And the absence of motorboats (and nearby development) helps explain another treat: An almost complete absence of litter and associated redneck flotsam (what my kayak companion calls "yahoo spores") along either river. 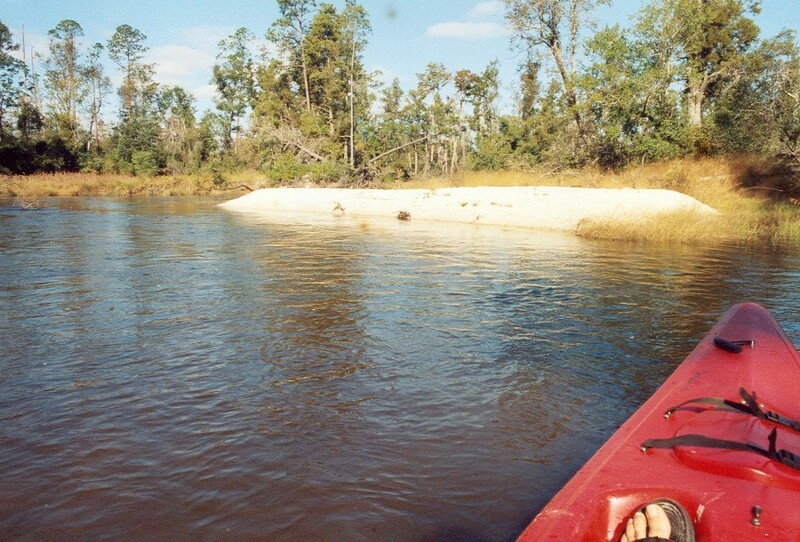 In sum, the Perdido River is a top-notch Florida river. I would rate it an 8 or 9 out of 10 for quality. The Econfina is clearly a 10. The most attractive, exhilarating river I've ever experienced.